Contrary to common belief, the appearance of sun-damaged skin cannot be reversed at the surface. To create optimal change to the skin's surface, the layers under the skin must be treated. With new and advanced technology, there’s a great way to now fight the signs of aging by penetrating the deepest layers of the skin. Broadband light treatments (known as BBL) offered by Beautiful Orlando uses light energy to safely and effectively damage the underlying tissue to promote new skin growth and regeneration. As the skin regenerates itself, the result will be younger-looking, healthier skin on the surface. Beautiful Orlando, directed by our trusted practitioners, offers BBL to Orlando area patients seeking to find relief from rosacea, acne outbreaks, brown spots, telangiectasias and reduce facial redness. Forever Young BBL incorporates the science of gene expression to target the deep layers under the skin's surface. As new cells form under the skin, the genes within these cells are directly impacted by the aging process. Essentially, they are already aged just like the skin when they develop. The cells are genetically transformed when BBL targets them using light energy, which can in turn transform the skin. BBL helps to diminish the fine lines and wrinkles, as well as pigmentation, sun spots, and other skin irregularities caused by both the sun and aging. The Forever Clear BBL acne laser treatment is a new and advanced treatment that utilizes broadband energy to treat acne without the need for topical creams or oral medications. 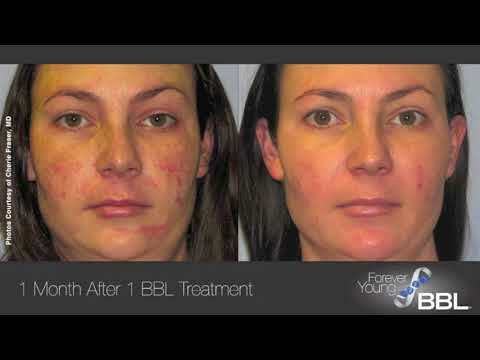 Using BBL, the Beautiful Orlando team will target acne-causing bacteria, decrease redness inflammation, and help your blemishes to heal more quickly, leaving fewer scars. Before beginning your treatment, our team will apply a topical numbing cream after cleansing your face. After covering your eyes for protection, your treatment will begin. BBL is great for anyone who is concerned about his or her aged skin and wants to look younger. This FDA-approved procedure is noninvasive and works well on all areas of the face to target brown spots, freckles, redness acne outbreaks. Patients with pigmentation issues, sun-damaged skin, large pores, or freckles are also good candidates for this treatment. BBL works best on light-skinned individuals who typically do not tan. BBL works best for skin types one through four. "Great service! Amazing staff and very caring medical doctor. Highly recommend the spa and the doctor for your medical needs." "This was was a very wonderful experience. The staff was professional and I’m very very pleased with my service. I will be coming back." "Very good services and nice staff"
"I love this place they are perfect I did laser hair removal and I’m so happy with the results"
"I have been getting Laser Hair Removal treatment and it is been working for me very well. I like this place and will recommend to everyone." Prior to undergoing BBL, we will give our patients protective eyewear to prevent any damage from the light source. A cooling gel will be applied to the treatment area and the aesthetician will glide the handheld light source over the area. Depending on what is being treated and the severity of the condition, varying strengths of wavelengths will be chosen to penetrate the skin in order to reach deeper levels. Most patients report feeling little to no pain, but just slight discomfort that resembles a rubber band snap. It takes several days for patients to see their results. Immediately following the procedure, patients will notice some redness and swelling on the face, as well as splotchy patchy areas of darker-colored skin that generally subsides in a couple of days. It is advised to avoid strenuous activities such as exercise during the initial healing process. To achieve best results, a series of sessions spaced a few weeks apart is usually recommended. Since skin can’t effectively be treated at the surface, it’s time to go deeper with BBL to produce younger-looking, healthier skin. If you would like to learn more about BBL and the other nonsurgical skin rejuvenation treatments we offer, please contact us today to schedule your skin consultation.